I don't know do you find things like these useful: - Instant traveling. Fly paths will instantly teleport you to your destination. You get command to instantly teleport to city. You have no cooldown on hearthstone. So you pretty much cut your traveling time to nothing. - No more corpse runs, you can just resurrect at spirit healer without punishment. - Save gold, no more repair bills. - Get leveling and to an extent gearing done faster with 30% more EXP(if you also have heirlooms, that would be a lot), reputation(rep gear, toys, mounts companion pets), artifact power(you get artifact perks faster and with that get stronger) and honor points(meaning more PvP gear). - Also in case realms become overpopulated, you won't have to wait for log in. And you will have instant log out. So yeah, in case you have money to dump and don't want to give it to Blizzard, it is worth it, since you will cut out on boring parts and get things done faster. But for me that is not what I am looking for in private server, since if I wanted subscription I might as well go to devil himself, in other words, retail. But if you want cheap boost, by all means you will get few good advantages. Granted most of them are far more useful while leveling, they can still save you on grinds either at high end(AP and rep gear) or with various fun stuff. There must be a way to restore access to your account. Phones these days are often replaced every two years. Not to mention what if you break your phone or have to factory reset it... On retail they did remove my authenticator once. But anyway. searching just for term authenticator will bring you plenty of posts with same problem... Here are answers other people got: Source: Or this one: Source: Those two answers mostly repeat. With few which state they won't manually remove authenticator. I guess you could still try what those two suggest. I linked topics below post quotes, so you can check out original posts. I guess those are your best bet. Personally, I would at least go for MoP. Reason is that WotLK and Cataclysm realms both started as independent French servers, and when servers joined, they became Firestrom. But Those two had large existing French base and did not get much attention from English speaking player base. Both had separate English realms which were merged into original French realm, due to low population. At least I think Cataclysm also had one, not 100% sure on that one, but WotLK did, they even made event for free L70 characters and it did not help. But MoP and WoD realms both had international release, where English player base came in. And they were first servers of their expansion on private server scene. 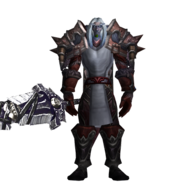 While on MoP, population has dropped and they are planing to merge all realms into one, you will at least have big group of players who do speak English. But there will be a lot of Spanish players, right now we have 400 players on English realm, 480 on French and both Spanish realms have population of about 1750, if we round it up. So if that goes through, brace yourself for that. Do note however that I did not play Cataclysm here, so I can't really say about actual state, but that is my thought on the matter and I do believe I am pretty close to how it is. If you are planning to play retail too, then I would recommend to make a copy of WoW folder. Locate where WoW folder is default I think it is: C:\Program Fildes(x86)\World of Warcraft\ Choose WoW folder and make copy, I would recommend you to copy it outside Program Files, for example make Games folder on drive C: C:\Games\World of Warcraft\ Then use that copy with FS launcher. That way you can still play retail. And you can easily use retail launcher to keep it up to date, without breaking copy you use on Firestorm. Otherwise I would still recommend you to keep backup copy around, just in case, if something goes wrong. Easy, you use old and established realm to bring things into new realm where you are supposed to start fresh. While yes, they do allow you to take a lot of things with you. Those things are very obsolete. Old gear does not matter in Legion, old potions don't matter, old materials don't matter, since you can pick up any profession and do Legion things at any skill level, glyphs don't matter since they are cosmetic anyway and most will turn to trash,.. but there are two things you can always sell regardless of expansion. Mounts and companion pets. Because you can use existing realm to prepare and farm them a lot in months prior to release and you can still sell them for high amounts of gold, if they have lower drop chance. It is not straight up cheating, but it still is. Imagine yourself going working and saving money in a country with high standards and high pay, while you can be considered regular person there. Move to some much poorer country, where normal man gets 1/100 of what you get. And guess what, you will live like a god, because everything will be so much cheaper. Same applies here, you are taking huge wealth from old realm, where it might not be worth much and bringing it to new realm where people don't have that much and then sell it really expensive since everyone is busy with Legion stuff and not farming old content. You and people who think like you would get huge advantage and create basically elite 10% of population with 95% of gold on the realm. Effect on economy would also be similar to what you would get if country would simply start printing more money when they are running out. You get to buy lunch with 1000000 of whatever currency you use instead of 5-10, since currency becomes so worthless. Except in your case, money printing machine is old realm where you farm and your preparation. Or basically, it is like you would find really early exploit in realm, abuse it a lot, then walk away with gold capped characters, while marked crumbles. You win, people who start doing it quickly win, people who come late get bread crumbs, and lose like people who came too late. Copying will only create a copy, as far as I know you keep character on old realm. Because they want to limit inflation levels maybe? Because it tends to get really bad when basic stuff cost in thousands of gold. Otherwise people could bring in millions of gold and sell overpriced stuff, making very unfriendly environment for everyone who comes to Firestorm as new player. Copies of already successful characters would be mandatory in this case or at least people who did this first will win, everyone else will lose. Also what you stated above is same logic as retards use for cheating. Like "No, I did not change anything on server, I only changed my client, I should be allowed to do that." or "I paid for this hack, now you have to allow me to use it.". So yeah , start thinking, it is not hard to imagine why they don't allow you to do that. Just grab it from Blizzard. You can either get it here directly: https://eu.battle.net/account/download Or download Battle.Net app and use it to download Legion: http://eu.battle.net/en/app/ If you use this method, make sure you move WoW folder somewhere else, when you will use it on Firestorm. So there won't be any conflicts with BN app. Also in both cases, make sure it downloads fully through red, yellow and green phase. I have retail clients for WotLK, Cataclysm, MoP, WoD and backup copy for Legion. So I never had to download client from any server. That is why I also recommend you to do backup copy. Having external USB drive is awesome for that, I also make backup copies of latest versions of all add-ons I use for every expansion. I would also recommend you to grab it before 7.1 on 14th October, just in case there will be issues. It is unlikely, since WoD clients were always compatible with servers on lower version, but you never know till it is out. Personally, I would be more worried about that meeting they had with Blizzard. They might have hard time going after server. But then again, they could go after people, unless they are from Russia too. And thanks to the meeting, they probably did not come as Anonymous to it. Wouldn't be first time project shut down after staff or owner got lawsuit threats. I guess we will have to wait and see. Basically, any private server can be shut down, if companies press hard enough. That being said, there are ways to counter that. From using the fact that international laws and cooperation is not always on best level and ways to hide, you can be very resilient to it and any server can return afterwards, as long as they have backups, will and can do that with low risk. Like for example The Pirate Bay, it got raided, shut down and so on, yet it is still here. Nostalrius also wasn't actually shut down. Blizzard or some of their legal departments did send cease and desist notice to their host. And after learning about it, Nostalrius voluntarily shut down. They weren't forced and did not try to resist. They could simply change host, hide behind CloudFlare and continue. Also for large part, Blizzard is no longer shutting down private servers. Ever since TBC or early WotLK era, they stopped it. Nostalrius was exception, because it became too popular. It grew to huge population in really short time, everyone was talking about it and it was just too famous. Blizzard was forced to act on it. Because in their case, if they left Nostalrius and just look away, they would lose hold of their intellectual property, in this case WoW and would have much harder time arguing it in the future. Basically if you are not protecting it, you lose it. So they had to go and do something about it. But yeah, server can be shut down in various ways. Either case and desist notice with following lawsuit. They can do this to host, which is easiest, but also easiest to fix, since you only need new host. But same can be done to organization or individuals who work on server. Latter is worst, because individuals don't usually have money to combat it and often will settle outside court or simply obey case and desist. Also setting examples helps. Like Nostalrius was great one to shut down, now a lot of players won't want to play anywhere out of fear, since same could happen to other servers too. Like after they successfully shut down MegaUpload, A lot of file hosting services simply shut down, just to avoid same happening to them. Same was with many torrent sites, after major sites get raided. Like BTjunkie. Last thing you can do to server is to cut it's profits. Simply pressure services like PayPal and they will stop working with private servers. Like PayPal actually does not want to do business with file sharing sites anymore. Also they don't work well with private servers either, which is why some private servers don't have PayPal as payment provider for donations. Most servers don't run just for free and not every owner is willing to pay things out of their pocket. There are exceptions, but a lot of them shut down after a while. Either person owning it got their diploma and don't want to search for job while having server to work on. Private server is not something you would always want to put on CV. Or they get bored with it or simply don't feel like doing it. While servers with donations have their downsides, they are more likely to stick around, since it brings in some form of profit. But as always, there are exceptions. Firestorm for now is safe, I am pretty sure they have some countermeasures to protect themselves and their staff members. So at least unlike Nostalrius, they would most likely fight it. But yes, big companies can go against any private server. Not just Firestorm or Nostalrius. Bigger the server is, bigger the risk is. Especially if it is fast growing servers. But for FS, risk is as low as it gets. TL:DR version: Yes, there is always risk, unless you play retail. But it is not very likely. Make sure you grab latest drivers for your hardware. Especially graphic driver from nVidia, At least that helped to me, when I got similar problem. If you don't want to do too much searching for other drivers, you can grab Driver Booster(http://www.iobit.com/en/driver-booster.php), I use it for a while now. It will automatically scan your drivers and search for updates. Free version will do exactly what you need it to do. Except from graphic drivers, I recommend you grab those directly from nVidia. I am not really good with recommending stuff to new people but anyway. What I would recommend people new to WoW is to just explore and look for various guides. It is easy to learn things this way. But I guess here are some I could give: - Do some research on your class. Class is something you will invest time in and you want it to be fun. Think about play style you enjoy and decide based on that. Like do you want to be close and personal with mobs? Do you want to blast everything before it gets close? And decide based on that. Also for tanking and healing, you will need to do more research at higher levels., since you get more power to mess up. Basically what worked for me as beginner in WotLK was hunter for it's pet and solo ability. It was bit annoying, because arrows take inventory space, cost and you have to feed your pet to keep it happy. And druid for being jack of multiple trades. It is fun how you can be cat DPS, then tank rage quits and party can still do the dungeon because you can go bear tank. Or to battle ress or pop tranquility to save dungeon/raid. Shame some of those stuff don't work on retail anymore, due to changes. But that was just for me. - Do keybindings. Don't click your abilities. As someone who learned that at level 70+, I can tell you, no matter how good clicker you are, reaction time will improve a lot when you keybind. When I did this, I went from being at bottom of scoreboard in PvP to upper half. I never was top, but still, it was noticeable improvement. And using crowd control became a lot easier. - Learn how to do auction house. Seriously, use it to sell stuff. You can earn a lot by doing this. Especially with professions. Even gathering ones. - Learn your class. Having right gear and using more than one ability will get you far. Like warrior has no reason to equip intellect mail/plate. - You won't need this while leveling, due to rates, but don't forget to queue for dungeon finder. It is fun bit of group content and a way to gear up once you hit L80. - In WotLK, do your class quests, but don't follow travel around the world quests. With as high rates as you have on FS, you don't need it at all. It will just slow down your leveling. Unless you find questing fun. If so, don't forget to turn low level questing on at low level zones. Gathering professions can also be fun if you are doing them while questing. At least I liked quests. - With so high rates, you might want to level up first, before doing professions. Can't remember profession rates, but unless it is same as leveling and close to 1x, you will just outlevel it. Unless you don't mind spending more time in lower level areas. But if you want to earn gold, they can still be worth it. Generally for new players, I recommend skinning and either mining or herbalism. Because you can track only one thing, ore or herbs, and skinning does not need tracking. They are cheap to level, with needing upgrade every 75skillups and even without smelting recipes for mining you can still sell ore. Also at high rate realms people will need materials to level up professions, and not items, due to quickly outleveling them. - Save money. A lot of gear you need will come from quests, so don't buy too much of it. One thing I always recommend people to expand is bags. That way you can carry more and not have to return to vendor to sell junk. Or even valuable items. But nothing is more important than class abilities and saving for mount. Both make life easier. And in WotLK you need to upgrade your abilites to higher rank. Don't forget to go to class trainer every level or two. Also with point of learning abilities, if you know your class you will know what you can skip. With high rates, you will probably have too little gold to buy every ability at low levels. - Learn how to use add-ons, they can make a lot of things simpler. Yes they will look confusing at first, but you will get used to it. Ones I recommend are: Deadly Boss Mods - A lot of boss warnings, on what you can expect, what you should interrupt, when certain spell will be used and stuff like that. Skada/Recount+Threat - Threat meters will be very useful in group content, warning you how close you are to get full attention of that big mountain you are trying to kill. Carbonite - Alternative for map and minimap. And it was add-on that learned me how to navigate in game. It has a lot of handy features, like showing you where to go for quests, map replacement, that works a lot more like google maps, like you can zoom out and in with mouse wheel from seeing whole world to minimap level. Thanks to this add-on, I never was lost again in WoW. And got it recommended while asking for directions around. Because I was in wrong zone where mobs could one hit kill me. I also replaced minimap with it. And it also shows level range of all zones and instances. Bartender - It will make managing your ability bars much easier. From having more than one bar displayed to simple hover and hit key to keybind. Also you can move them around, resize,... But on WotLK it does require a bit of configuring. Cataclysm version works a lot better out of the box. Bagnon - Turn those multiple bags into one big window. Also search before it was a thing on retail. OmniCC - It will show cooldown timers in numbers. Not that cloclwise going grayed out effect of default. Tidy Plates - Alternative to health bars you can see on mobs. Also it can be configured to display your debuffs or damage over time effects handy on mob. Shadowed Unit Frames - Very configurable health bars for you, target, party, raid,... I would wait with this one for latter. It will require quite a bit of configuring too. Auctioneer - This will make auction house a lot less work. What it can do for you is to have simple apraiser where you can refresh auctions of same item, to see where prices are at. Also if you regularly scan auction house it can show you how expensive is something based on average price. Like you will want to buy item if it's cost is 20% of average price. Or you will want to wait if it is at 300% of average price. Also it will make search pages bigger and it will allow you to sort items based on iLevel, which tells you a lot more about how strong something is than required level to equip it. Also if you get full suit, it will extend tooltips with a lot of item info, so you will know which item is actual junk and which is crafting material you might want to sell. Postal - Get that auction house mail in one click, instead of 100 clicks. Prat - Ability to copy/paste from chat. Clickable links for easier copy/pasting. Timestamps for chat. For add-ons, just make sure you find proper versions for WotLK(3.3.5a). If you have hard time, I can provide you with some links. Above add-ons are just few I simply won't play without. Another totally not important thing I did, was to download that Bejeweled minigame as WoW add-on. It might feel useless, but when you are waiting for raid to gather or you are on that 5min flight path, it is something fun to do. Just make sure you disable popins when you don't want it. Last thing, finding nice guild can make world of a difference. You will need people to play with at high end anyway. Also they can help you with things. Personally I would never get into WoW, if it wasn't for my first guild. Real life friends and class mates got me in game. But I would quit, if guild wasn't cool too. Nope, only way you can skip things is either by buying instant max level or by buying character from other players. Last one is official feature of Firestorm, you can auction off your characters, also you can get better gear and stuff with it.But yeah, no transfers, those are usually tools of smaller servers, which are desperate enough for new players and are willing to deal with potential scams. FS does not need it.